I'm painting my front door this weekend... again. I say again because my front door has been so many colors, I'm surprised it actually closes. Today I'm painting over the red. I got some really bad advice about painting my front door a couple of years ago. 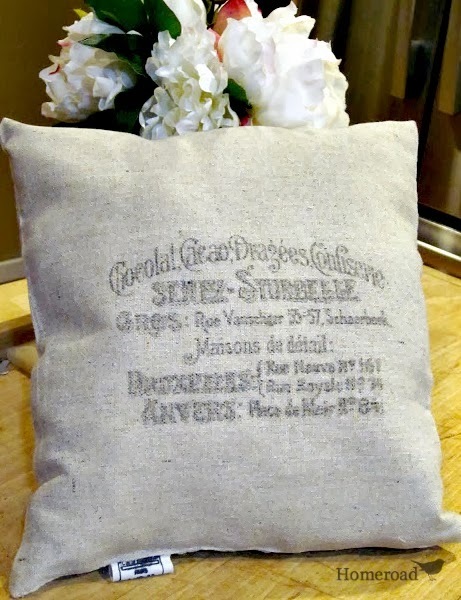 I was told to paint with Annie Sloan Chalk Paint and not to wax it because the wax would melt in the sun. This is true but I was told just to leave it unsealed and it would be fine. As you can imagine, the door was way too chalky and every mark showed. It was a mess! You can tell how many colors my door has been painted because this is the first time I've actually removed the door knocker. Green, black, red, black again, yellow, red and now... blue! See the yellow front door here. My kids made me paint over it... big mistake! 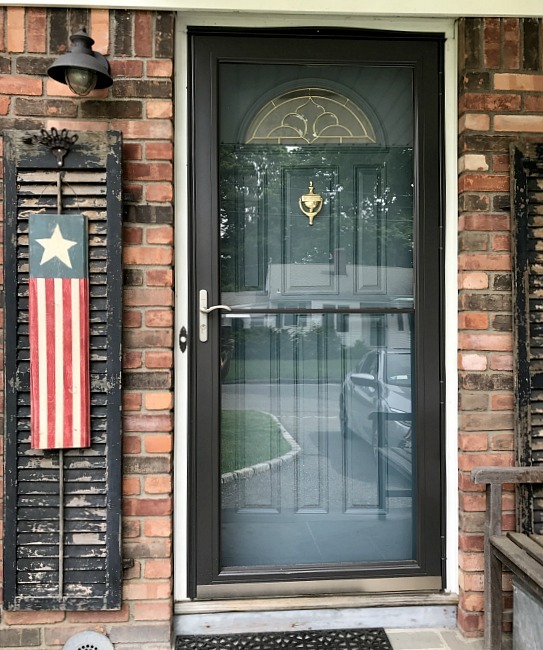 I will admit I have commitment issues about my front door and yes, if you know me... with my cars as well but that is a another long story! Today I'm doing it right! 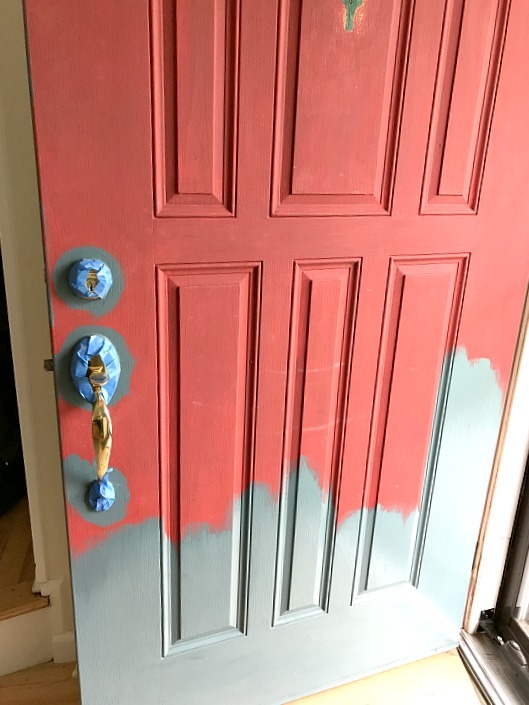 I'm a painter so there is no reason for me to have a bad painted front door. I taped up the handle and the lock and got to work. 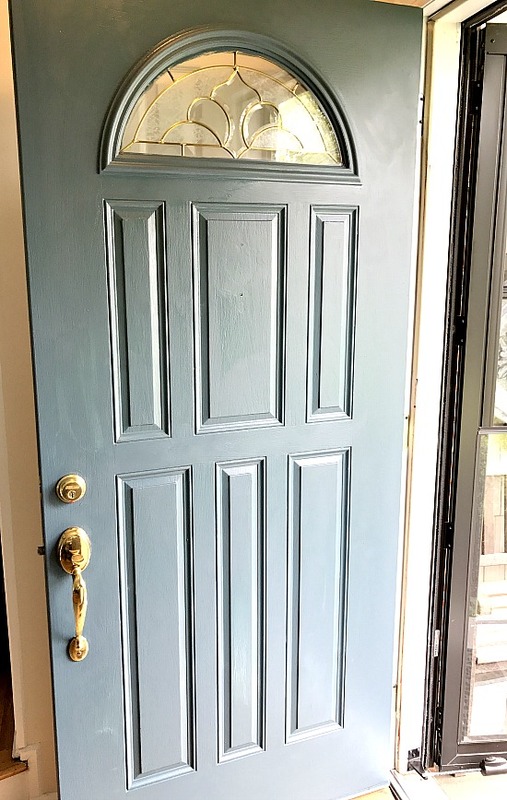 I'm using Fusion Mineral Paint in Homestead Blue which is a chalky paint with a sealer and it did this door in one coat!! Yes I said o.n.e. coat! When I removed the door knocker I soaked it in Brasso for a while then shined it up with a rag. Wow! I don't even remember it ever being so clean and shiny. This door knocker has been on our front door since 1991. It was a gift from my cousin Jeff and 26 years later, it still adorns our front door. As I said, the door only needed one coat of Fusion Mineral Paint and it looked gorgeous. I returned the shiny door knocker to it's rightful place and it was a wrap. 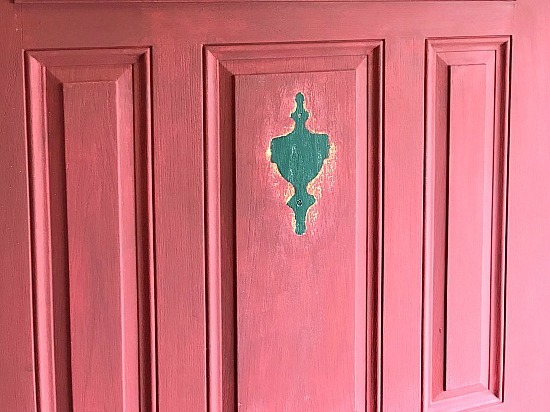 It took longer to tape and clean the brass then to paint the door. With results like this I could paint it a different color every season! It's a little hard to see how pretty the color is with the glare from the storm door but it is super gorgeous and looks brand new! 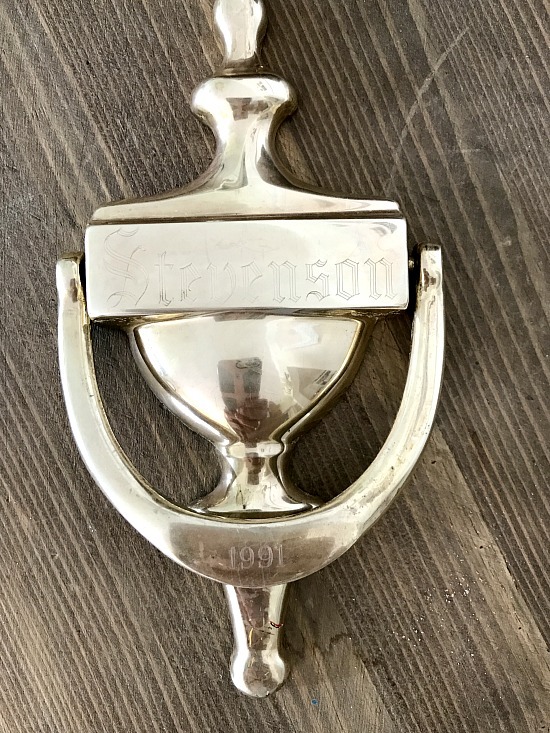 Need a new door knocker for your door? Check out my affiliate links below where you pay no extra fees. Linking to Funky Junk Interiors. 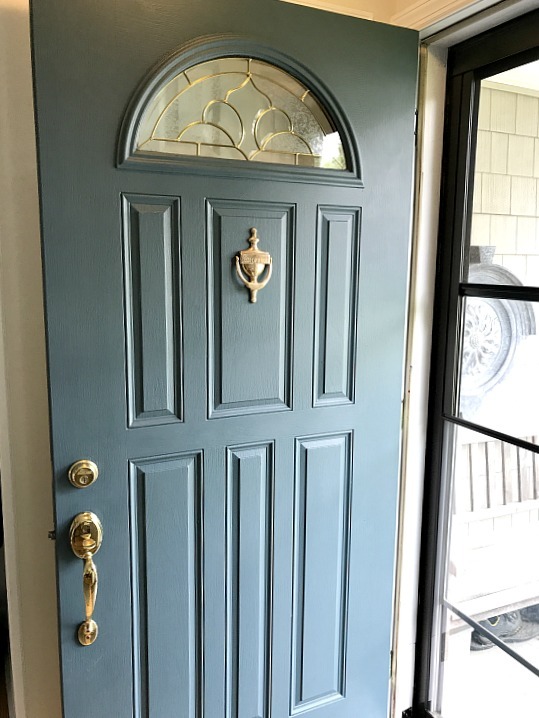 I am going to re-varnish our front door this season, before it gets too hot in the New Mexico sun! 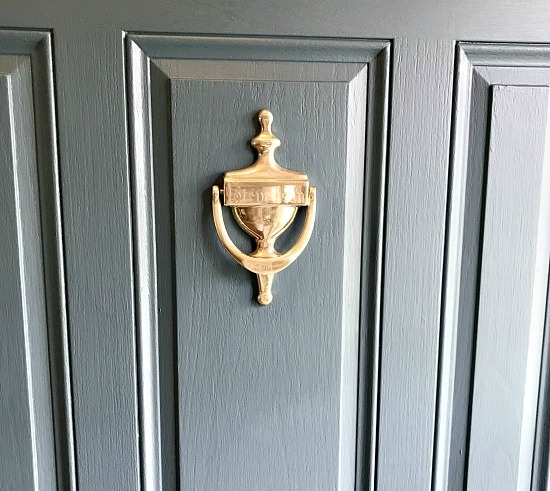 Your painted door looks marvelous and your door knocker is outstanding!!! Good job! How would you compare the Fusion Mineral Paint to Modern Masters Paint? Fusion is fabulous! Sticks to everything, is durable, self leveling, self sealing... the best paint I've ever used. I get no money to say that... I just like this paint the BEST! Looks great. Have you tried to put window tinting on the storm door to cut back on the heat ? That is a great suggestion. Luckily the heat is not an issue here because the door is in the shade most of the time :) thank you! Your door looks awesome! I love Fusion Minerals too but never thought to use it on my front door which I'm so ready to paint! What kind of sealer did you use? Thanks! Our door is a mess. The paint we used never cured and we have a cat and dog so you can imagine the mess. I definitely think we have to strip it first but I have read a lot of great things about Fusion. We have those fake shutters outside too, I am kind of thinking we would have to seal them because they are in all of the weather. 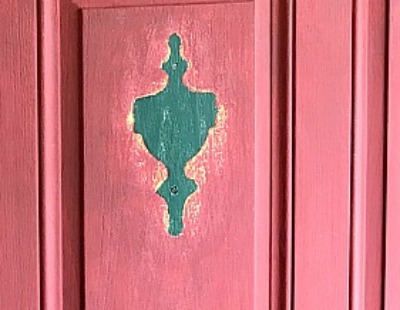 Love your door knocker and the color you chose. Melissa I do not think you need to strip or seal with this paint. I would give it a try and what's the worst that could happen... you'd have to strip it off. I would give it a try. This paint seriously paints over everything. There is also a bonding agent for really shiny surfaces. wow. that last paint job really turned out the best. I went back on your links to the yellow paint job and got a kick out of all the colors. 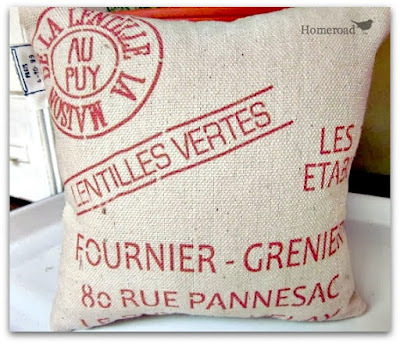 I have been thinking of using Fusion or Dixie Belle on a large bead board wall we put in a while back. I have been delaying because I thought I really needed to use a quality paint like BM or SW, but now I think I'll just go ahead with the Fusion and be done with it! Analysis paralysis be gone. Go for it! The fusion totally covered (in this color at least) in one coat! It was so easy... just do it!